People who have recently lost a pet are finding comfort and understanding through support groups at animal shelters. When a pet dies, the Seattle Animal Shelter sends a bereavement card. The cards are the brainchild of shelter volunteer Connie Starr, who also helps lead the weekly pet bereavement group at the Seattle Animal Shelter. “It’s a grief that society doesn’t recognize or support,” Starr said. Kathy Herbert was surprised when she received a card in the mail from the Seattle Animal Shelter, a sympathy card over the loss of her beloved 13-year-old dog. “Our loved companions never really leave us. 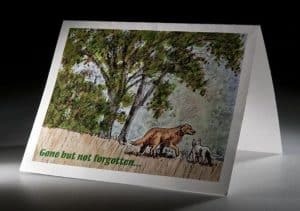 They live on in the happy memories of the times shared together,” said the card, sent in the memory of Herbert’s dog Alex. Tucked inside the card was an invitation to attend a weekly pet-loss support-group meeting at the shelter, which Herbert attended with her partner. The Queen Anne residents were still mourning the loss of Alex, a golden retriever-mastiff mix that died after a tumor was discovered. Many who attend the pet-loss group talk about how hard it is for friends to understand the loss when a beloved pet dies. Since last March, the Seattle Animal Shelter has been sending out about 35 cards each week, at a cost of about 84 cents each. All of the money has come from donations, said Kara Main-Hester, with the animal shelter. The shelter learns about the pet deaths when the owners return a license-renewal notice to say their pet has died. The cards are the brainchild of shelter volunteer Connie Starr, who also helps lead the pet bereavement group. Starr had a 5-year-old Siberian husky who died suddenly, and she realized there was no support group for those who lost their pets; no one brought over casseroles. Starr put together a volunteer group to lead weekly sessions. Bruce Friend is one of the leaders, volunteering at the shelter after the death of his cat Richie in 2007. “People think it’s not normal behavior to grieve over a pet,” said Friend, but he said he was so devastated he called the Seattle Crisis Clinic, which put him in touch with the shelter’s pet-loss program. Sarah Yeager lost a dog — an Australian shepherd — and received a condolence note from the shelter. Chris Northcross attended a pet-loss meeting after his 13-year-old rabbit died last year. The Seattle Humane Society also runs a free condolence group for those who have lost pets. It meets at 10 a.m. Saturdays and is run by volunteers. After each session, the volunteers send sympathy cards to everyone who attends. Herbert and her partner have since adopted another dog from the shelter, an English cocker spaniel that was rescued after it was found wandering the city.